Grundmann, Reiner. “Regarding Experts and Expertise: A Reply to Szymanski.” Social Epistemology Review and Reply Collective 4, no. 7 (2015): 19-22. Unfortunately, she does not tell us what is provocative about the book, nor what better provocative books should be read instead. Towards the end of the review she comes to the view that the ‘central motion’ of the book is uncontroversial. Maybe it would have been a good idea to state upfront that she is in two minds about the book, and explain in what sense it is (un)controversial. 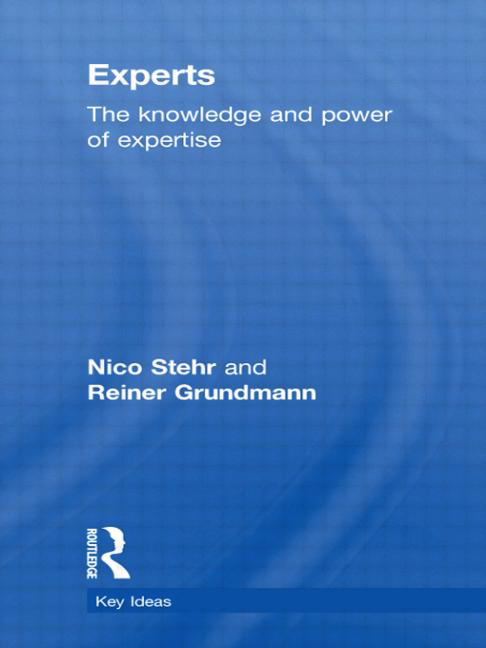 Our book outlines a conceptual framework, defining the roles of experts. We believe this contribution is necessary in order to clarify some of the contested (and convoluted) debates of recent. Much of the debate about expertise is normative and motivated by a drive to resist forms of ‘official’ expertise exercised by government officials and corporations. This critical impetus is valuable but sometimes gets in the way of a more analytical grasp of the matter. The observation that powerful networks have been able to enroll one type of expertise at the expense of another is separate from the question of how we define the role of experts and what we should expect from them. Our definition suggests that experts select and justify courses of action that are sought by clients who trust these experts. This social constellation occurs on many levels and in different fields, and we have merely sketched out where research should go. We certainly need detailed case studies to in order to make progress. Expertise is sought by individual citizens confronted with complex, contradicting information, by business leaders and, of course, by political decision-makers. The dominant epistemic cultures in each of these domains vary both over time, and across jurisdictions. The same knowledge base has led to very different policies with regard to nuclear power, genetically modified foodstuffs, or climate change—across countries, and even within one and the same country at different times. It is expecting too much from a theory of expertise to predict the outcome of such controversies. But it is misconceived to focus on these debates solely through the lens of certified/scientific versus lay forms of knowledge. In Chapter Three we examine the activities of experts and define their role in modern knowledge societies. We identify several key functions they perform: they mediate between knowledge production and application; they reduce complexity and create trust and legitimation; they define and interpret situations. Most importantly, they reduce complexities of knowledge with a view to recommend a course of action. We also point to the important social relation in which an expert operates, which is the accountability to a client. This definition of expertise is different to existing approaches in the social sciences, such those developed by Harry Collins or Roger Pielke Jr. But it is also different to the much praised work of Brian Wynne who established the lay expert as a category in science policy contestations. Our framework leaves behind the common assumption that expertise is science based, or mainly practiced by scientists—an assumption shared by many traditional observers, but also by several STS protagonists. These are good questions and it would be interesting to see how other approaches have tried to answer them. Based on our analysis we would expect that the market for experts will grow and the voices of different experts will be heard by their respective clients. However, the clients will make decisions as to who to listen to. Attempts to establish a hierarchy of knowledge will come from those who feel under threat, and it does not take not much imagination that it is scientists who feel uneasy about availability of ubiquitous expertise. From GMOs to climate change it is scientists who lay claim to epistemic authority. Similar processes are underway at the level of everyday life. We have seen an opening up of opportunities and spaces that had been dominated by professional expertise. Access to knowledge and tools of communication have led to the spreading of potential expertise, which often will be consumed by clients. We can illustrate this with the commonly used example of medical expertise. Doctors can be seen as a prototype of expert (mediating between scientific research and application; defining a situation and recommending a course of action; standing in a relation to clients). They are profession-based experts. But patient groups have access to relevant knowledge about health issues, too. A citizen as part of a patient group is thus a potential client of two different health advisory settings, her doctor, and the patient group. This opens options to her, and she can define and defend her self-interest much better. We would not go as far as calling all patients who have such experience ‘experts’. This wide notion of lay expertise would become next to meaningless. We think it is important to emphasize that it is always someone else who recommends a course of action to us, based on technical information. It is true that there are degrees of mastery of such knowledge but we would argue that two extreme views about them are unhelpful. One is to try to establish a ‘true measure’ of expertise, involving a hierarchy (this is likely to be espoused by scientists). The other is to attribute the competence of expert to everyone (the position of some STS scholars). What these extreme approaches miss is the interesting issue of how individuals and organisations navigate the difficult landscape of decision-making under uncertainty. Our suggestion is that it is important to examine the role of those who step in to offer a service in such situations. They need to gain the trust of their clients in order to be listened to, no matter if a payment for the service occurs or not. If the advice is followed lies only with the client. Nowhere in the book do we talk about ‘selfless experts’ as Szymanski implies. Nevertheless, there is a normative incentive for experts to be called ‘independent’—a label that often amounts to a badge of honour awarded by third parties (or power holders), but need not reflect true independence. It is an interesting question if all experts are to be regarded as self-interested, or if there are degrees of in/dependence. This question is not addressed in our book and it is not prominent in the STS literature either. It has been a topic of abstract debate in social theory (Habermas’s knowledge and human interest) and in the Sociology of Scientific Knowledge (Bloor), but much less in the STS literature on expertise. An exception is perhaps Pielke’s notion of the Honest Broker, which could be read as an institutional solution to deal with the problem of conflicts of interests. Interestingly, it could be said, Wynne’s Cumbrian sheep farmers are driven by self-interest in their conflict with government experts. There is a difference between knowing something (‘holding some form of expertise’) and being an expert. Of course there is no point in debating a ‘correct’ definition; it depends if the definition is meaningful and able to enlighten the analysis of social reality. A definition saying that all citizens are somehow lay experts can establish a baseline from which to make an observation about ‘official’ experts trying to displace and expropriate them. This is the underlying approach of much of STS work in this area—which also informs the spirit of our reviewer. But this does not tell us very much about the changing constellations in knowledge societies which lead to the emergence of specific roles that are occupied by a type of expert who is a mediator between knowledge creation and application and dependent on her clients, someone who defines and interprets situations for them and advises them on what to do. Much of the STS literature on expertise zooms in on the marginalisation of lay expertise. This has led to a problematic narrowing and twist in scholarship; it has become focused on issues of democratic participation and the role of science in decision making. With the normative questions looming large, there often is a sense of foregone conclusions when reading these studies. And the studies quoted by Szymanski all point to the process of marginalisation of lay knowledge. However, sites and types of expertise in modern society are more varied and complex. As we mention in our chapter “Hierarchies of Knowledge”, the discourse of environmentalism exemplifies a rise of marginal knowledge with climate change being a prime example. Bloor, David. Knowledge and Social Imagery. Chicago: University of Chicago Press, 1991. Habermas, Jürgen. Knowledge and Human Interests. Translated by Jeremy J. Shapiro. Toronto: Beacon Press, 1972. Pielke, Roger A. The Honest Broker: Making Sense of Science in Policy and Politics. Cambridge, UK: Cambridge University Press, 2007. Wynne, Brian. “May the Sheep Safely Graze? A Reflexive View of the Expert-Lay Knowledge Divide.” In Risk, Environment and Modernity: Towards a New Ecology, edited by Scott M Lash, Bronislaw Szerszynski and Brian Wynne, 44-83. London: Sage, 1996.